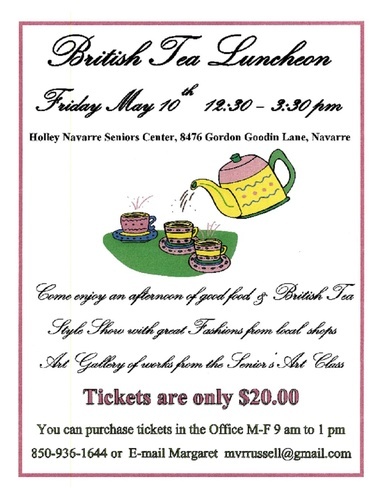 The Holley Navarre Seniors Center is hosting a "British Tea Luncheon" on Friday, May 10 from 12:30 pm to 3:30 pm at 8476 Gordon Goodin Lane, Navarre. Come enjoy an afternoon of good food and British Tea. There will also be a Style Show with great fashions from local shops and an Art Gallery of works from the Senior's Art Class. Tickets are $20 and can be purchased at the Senior Center Office Monday through Friday from 9 am to 1 pm.